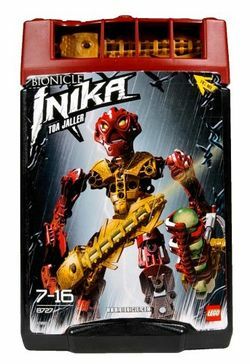 8727 Toa Jaller is a BIONICLE set released in 2006. He was the leader of the Toa Inika, having the power of fire. This is Jaller's second appearance in a set, or his third including in a Happy Meal at McDonald's. It contains Jaller, a sword that lights up, and a Zamor Sphere launcher. His head glows in the dark. He was transformed into a Toa by a bolt of lightning from the Red Star. This is a description taken from LEGO.com. Please do not modify it. (see an archive of the product's page) Nothing is impossible! Using his Kanohi Calix, the Mask of Fate, Toa Inika Jaller can pull off feats others might think impossible! His energized flame sword fires blasts of flame and lightning intertwined, while he can use his zamor sphere launcher to free enslaved Matoran. Includes a zamor sphere launcher! Jaller’s flame sword lights up with a strobe effect! Pushing hard on the piece near the rubber piece will launch a sphere. Pushing a button on his sword will cause it to light up. Facts about "8727 Toa Jaller"